Fabiola is a long time and valued member of the Humble Sewing Center family. She has in depth knowledge of just about every aspect of our products and merchandise. 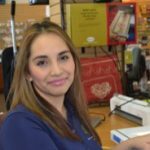 Fabiola is bilingual and enjoys helping all of our customers find the perfect machine of their dreams.